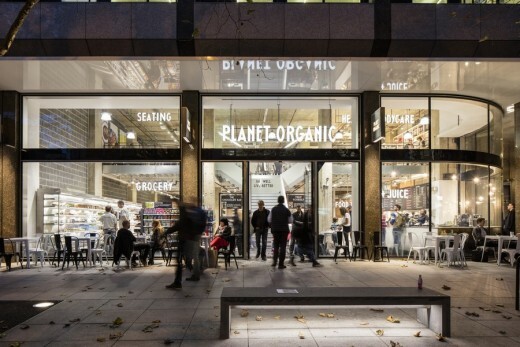 Architecture practice Orms has recently completed the refurbishment of 4,339sqm of retail space at 17 – 30 Tottenham Court Road. 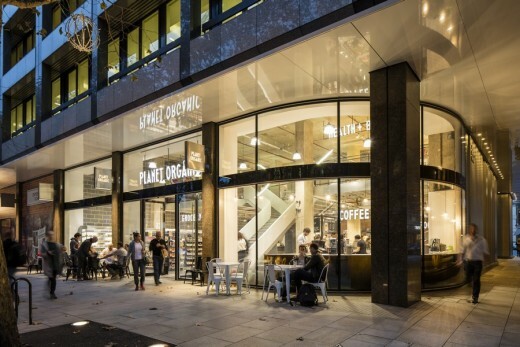 The completed project breathes new life into the previously outdated streetscape and now provides ten new retail units, attracting top brands including Planet Organic, Oasis and DF Mexico. Tottenham Court Walk is the final phase of a five year redevelopment project for the 1970s Central Cross complex on Tottenham Court Road. Earlier phases concentrated on the rebranding and refurbishment of the 13,427m2 office buildings at 1 & 2 Stephen Street, which Orms completed in 2014. 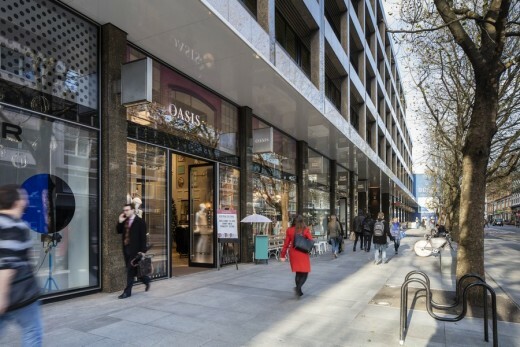 Orms’ brief for Tottenham Court Walk was to extend the retail facade and replace the uninviting retail arcade with a more inclusive and enhanced environment for the public, as well as improve the pedestrian experience. Orms pulled forward the façade of the existing retail units to fill the void of the dark arcade running along the building. The internal concrete and steel structure of a former car park at the rear was then converted into new lower ground retail units. New double height mezzanines have been inserted creating additional retail space, accentuating the double height glass façades. Carefully controlled external ‘flag signs’ and internal signage zones behind the glass shop fronts create uniformity between the units which helps reinforce the homogenous skin around the building. The low iron glass façade also provides transparency into the buildings, and allows the reconfigured internal spaces to engage with the street for the first time. 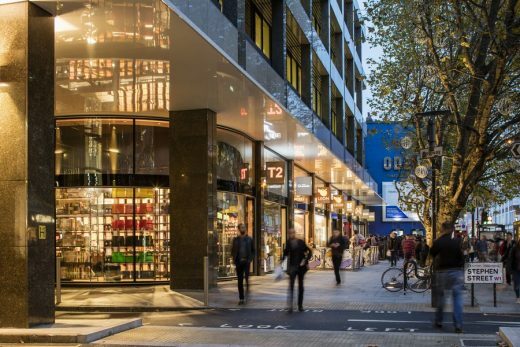 The shop front glazing is integrated into the office building 1 & 2 Stephen Street for the whole 250 metre frontages, creating a new architectural identity for the buildings. 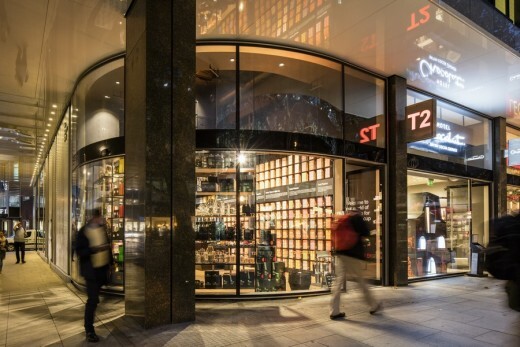 At the entrance to the underpass at Stephen Street, curved glass façades provide a strong feature to the two corner units as well softening the edges of the pedestrian entrance. Improved lighting and treatment of the horizontal and vertical surfaces create a strong linkage through the underpass better connecting the office and retail elements. The newly designed streetscape provides an improved pedestrian experience through new landscaping, paving, street furniture and lighting. The improved public realm now provides a continuous link between Tottenham Court Road, Rathbone Place and Charlotte Street. 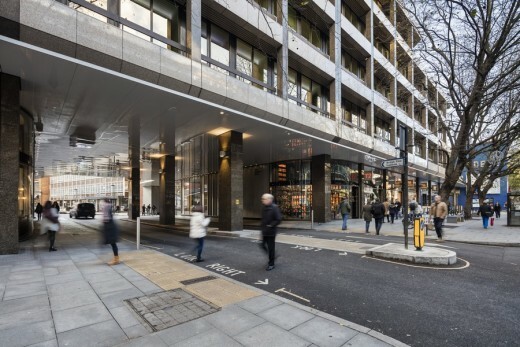 Tottenham Court Walk is one of several projects in the area Orms are currently working on, including Commonwealth House, St Giles Circus and Oxford House.